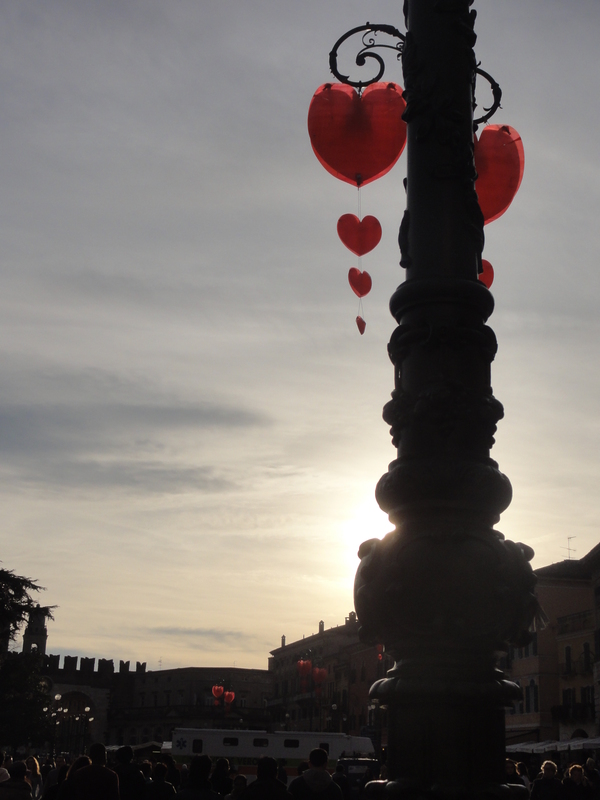 Romantic all year long, Verona is especially blushing around Valentine’s Day when the city is decked out in red for the 4-day Verona In Love festival. 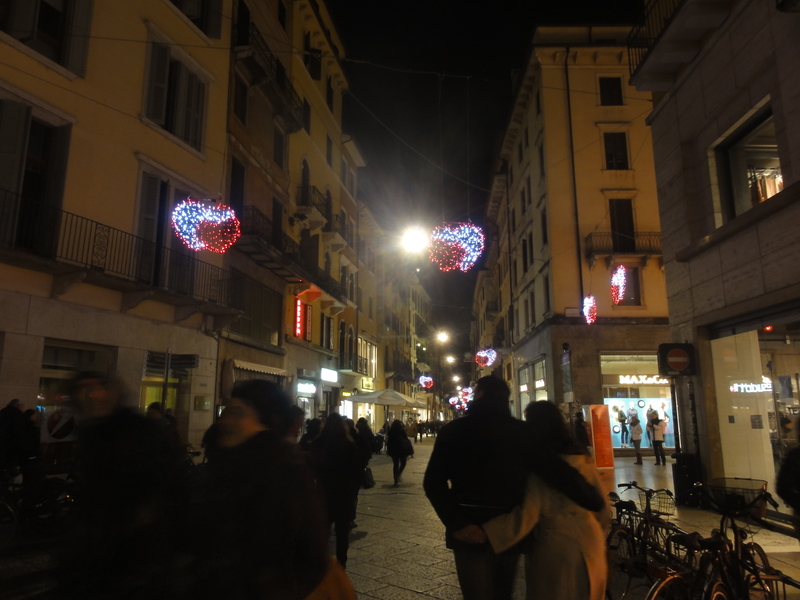 Couples can stroll beneath glimmering hearts that dangle along cobblestone streets or sample chocolates near the Arena in Piazza Bra. Lacking only a traveling harpist or street performers donning cupid wings and shooting arrows, the festival caters to every idea of love and romance. Singles, beware. 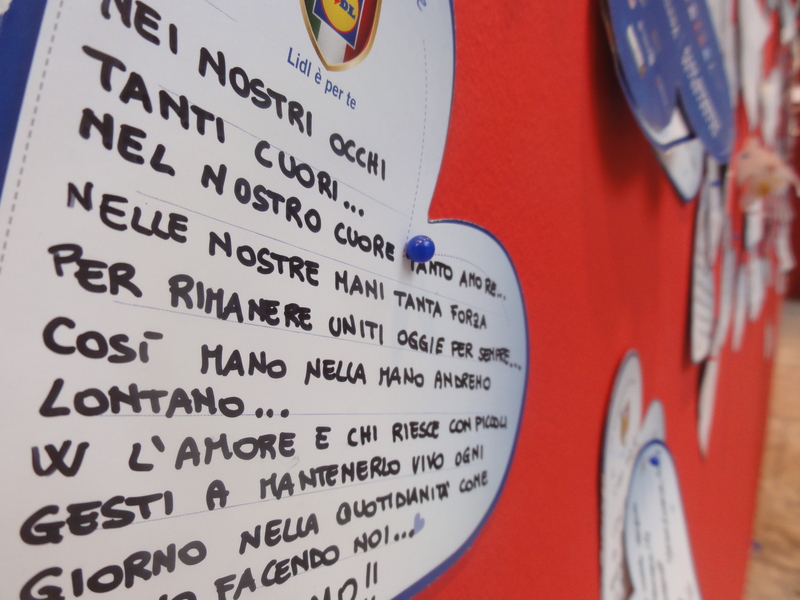 As the stars would have it, I was destined to visit Verona this Valentine’s Day, and not on my own, either. Instead, I arrived with two fellow teachers and a convoy of bright-eyed fifteen-year-olds whose energy levels were completely unaffected by the 1AM airport arrival and the subsequent 4:30AM flight. And that was that. I imagine her tour pamphlets are very sparse. Sidewalk cafe, great for vino and people watching. 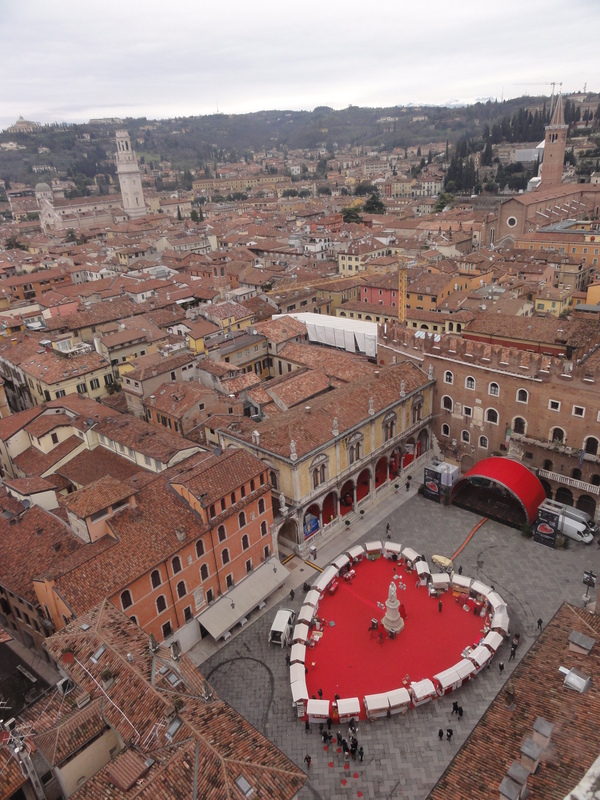 While the view from Lamberti Tower is uncontested on any day, it’s especially rewarding during the Verona in Love festival when the merchants in Piazza Signori organize their booths into a heart shape that throws a splash of bold red into the yellows, ochers, and burnt siennas of the Veronese landscape. On a clear day – without that air pollution we’d been warned about -, you can spot the formidable peaks of the Alps in the distance. 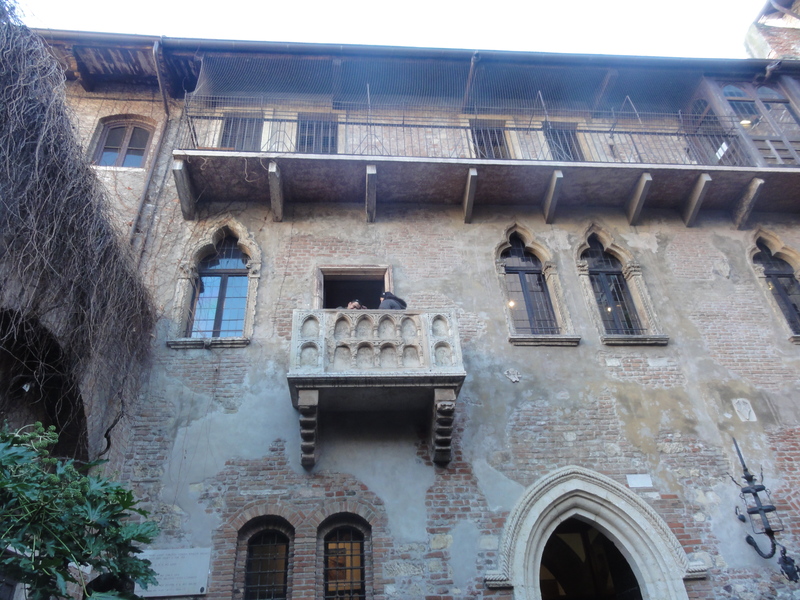 Romeo, Romeo, whereforeart thou Romeo? Juliet’s tomb is on the other side of town in a rather seedy area. It took us a while to find it, mostly because Alex and I ignored David’s repeated assertions that the tomb was located in a car park. It was located in a car park. Once we entered, we found that we were not in a tomb at all, but in a museum. We were told that the tomb was downstairs, so we eagerly descended only to find a room filled with urns. Disappointed, we explored the area unsuccessfully, prompting us to ask again for the tomb’s secret location. The museum attendant said this as if entering through an exit-only door was the most obvious thing in the world. We finally found the tomb, took some photos, and left. 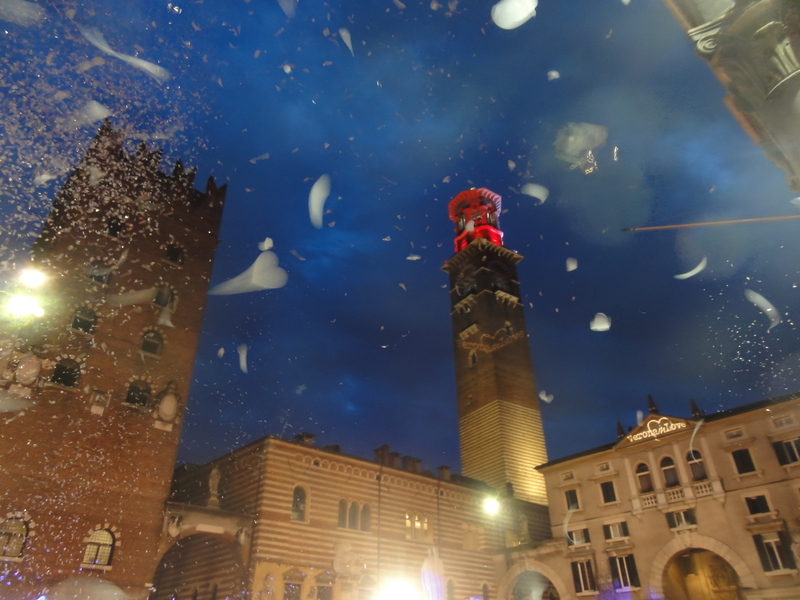 Piazza Signori was in full swing, with live music on the stage and free helpings of balloons and wine. The three of us tucked into a small cafe and ordered pizza while the kids trickled in to meet their 6pm curfew and see the “surprise”. A little after six, a dozen cannons positioned around the square went off, exploding thousands of paper hearts into the plaza. The lucky finder of a pink heart would win a car, but no one seemed fortunate as the car was still there when we left. 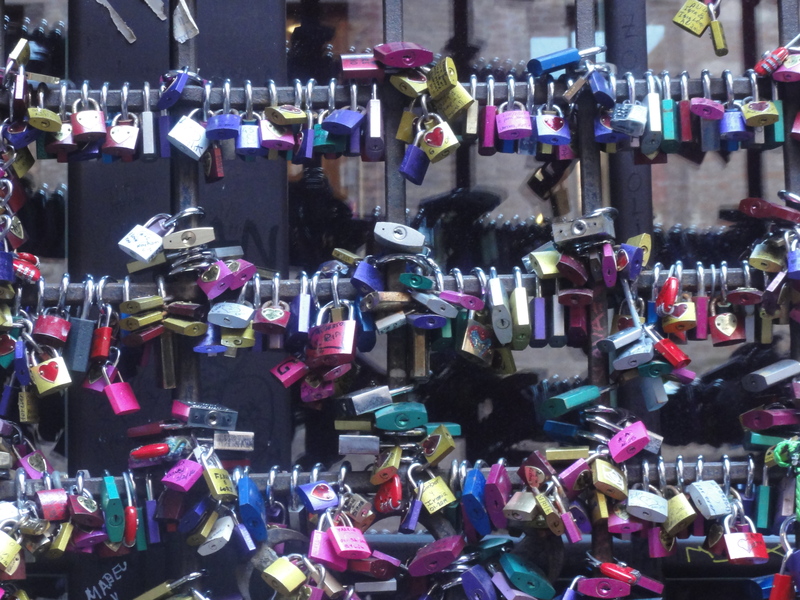 We left as the city embarked on its “Romeo and Juliet Half-Marathon,” something I vow to return for in the future. 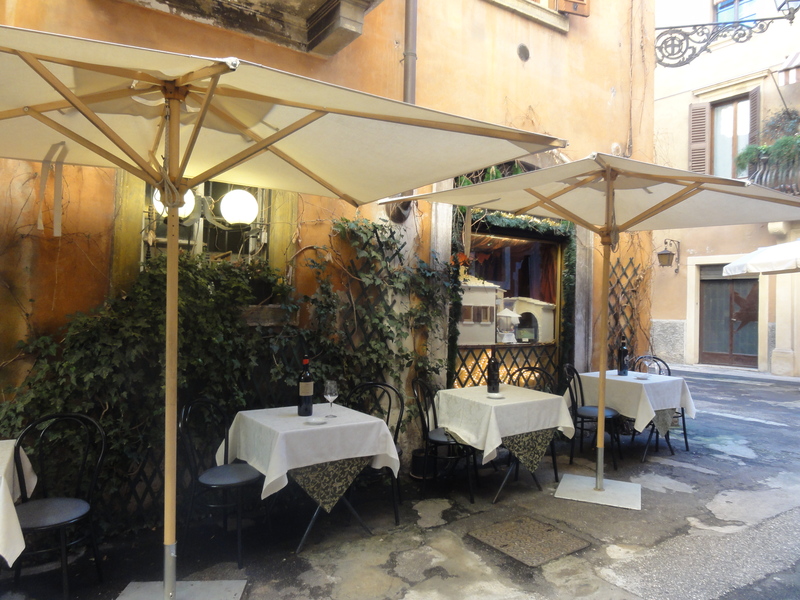 We all agreed that Verona was worth spending more time in, but we were off to Rome the next day for a new adventure. Pen your love notes for Juliet on paper hearts and tack ’em to a felt board.